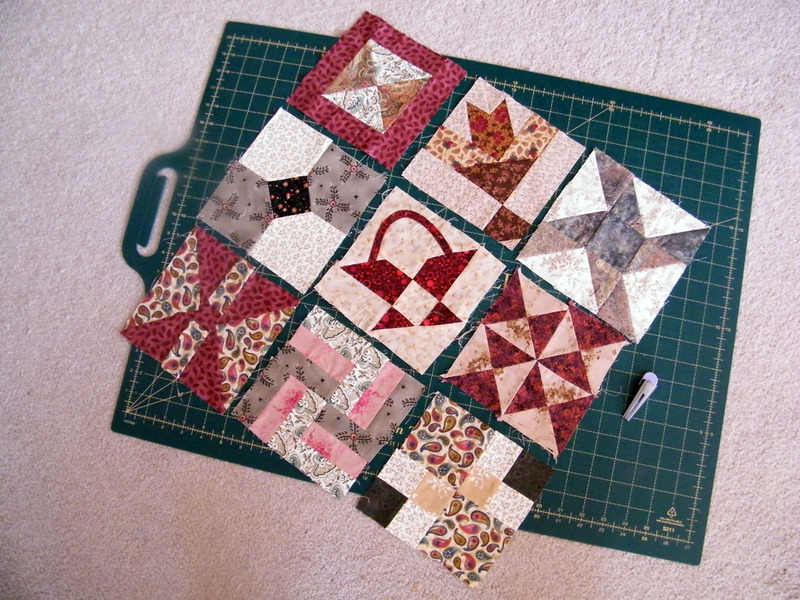 Now that my Gypsy Quilt is finished I have started on a Farmer's Wife Sampler Quilt from the book by Laurie Aaron Hird. It's a pleasant change to be working on something where each block is a different pattern. And I am also enjoying going back to hand piecing - so much better for doing all the fiddly little bits and pieces in some of these 6" blocks. I'm wondering if I could sneak in some machining in some of the less complicated blocks though, or is that a no-no in the quilting world to mix up the techniques ! At least the house doesn't seem to get in such a mess when you're only cutting out one block at a time - just a basket of fabric pieces which seem to tone together and a folder to put the finished block in - no piles of cut fabric lying around. As usual one of my main problems is getting every block to end up as the required 6" block plus seam allowances. But I did acquire a little gadget for folding the edges to make bias binding so I can see more basket handles coming up in the near future. I hadn't seen one of these gadgets until recently when a friend was making binding for a celtic mat. What would we do without friends near and far to learn from and to exchange information with. Looking up the dictionary for the meaning of the word friend after that last sentence I came across the word "trust" and I thought that was very applicable in quilting circles. Because we trust our quilting friends to pass on useful information and tips and we trust that any criticism they might give our work will be helpful and constructive. And that is the only kind of quilting friend that I have. Why am I not surprised to see you doing these tiny blocks? They look beautiful! your blocks look wonderful, the fabrics are just beautiful. I admire people who make these blocks you are so clever.